Home›News & Events›Challenging Circumstances conference tickets selling fast! Challenging Circumstances conference tickets selling fast! Tickets for the Sound Connections Challenging Circumstances Music Network conference on Tuesday 17 November 2015 are selling fast! Click here to make sure you don’t miss out, and to take advantage of a 30% discount on all tickets. The young person’s perspective on progression – led by freelance consultant Oli Kluzcewski. Young researchers from Wired4Music, Heart n Soul, Kinetika Bloco and Raw Material will be at the conference to share their stories and findings. The role of the ‘progressions support worker’ – led by Hermione Jones from the Irene Taylor Trust. If this interests you particularly, you might like to take part in Hermione’s workshop at the conference. 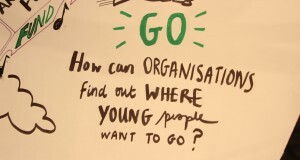 Supporting ‘next step’ organisations (those who don’t have a specialist focus on working with young people in challenging circumstances) to recruit and effectively engage vulnerable young people – led by Catherine Carter from Fairbeats. You can find out more about the progression routes work that has led to this project here.